dr. ali-muhammad varqá | doberman pizza. It’s with great sadness that the Baha’i world learned today of the passing of Dr. ‘Ali-Muhammad Varqá, the last living member of the Hands of the Cause of God, those selfless, sanctified souls appointed as servants and guides to the worldwide Baha’i Community, whose work, whose only passion was to protect and proclaim the Baha’i Faith in every corner of the globe. According to the Will and Testament of ‘Abdu’l-Bahá, the Hands of the Cause were appointed by the Guardian (Shoghi Effendi) and served under His direction. As the Guardian is no longer with us, however, the Hands of the Cause are no longer appointed, and their work is now taken up by the Continental Board of Counsellors, appointed by the Universal House of Justice. In a message sent today to the Baha’is of the world announcing the passing of Dr. Varqá, the Universal House of Justice pays him tribute and requests the prayers of the Friends everywhere for the progress of his soul through all the worlds of God. We have truly witnessed today, as Barney Leith puts it, the passing of a link with Baha’i history. An emphasis on group leadership, as opposed to individual power, runs throughout the Bahá’í administrative system. Individuals do not set policy or make rules in Bahá’í institutions — Spiritual Assemblies make the decisions, although they may delegate specific executive responsibilities. There are, however, several distinct groups of individuals who are recognized for their spiritual capacities and experience. They play a special role in inspiring and advising the Bahá’í community. Although they have no decision-making power, their ideas and insights are regularly sought by elected Bahá’í decision-making bodies. Foremost among these advisers are the “Hands of the Cause of God.” This title has been given to 50 individuals in the history of the Faith; all were chosen by Bahá’u’lláh, referred to as such by `Abdu’l-Bahá, or appointed by Shoghi Effendi. No more can now be appointed. In 1968, the Universal House of Justice began to designate a number of spiritually mature and experienced individuals as “Continental Counsellors,” so as to extend into the future the functions of the Hands of the Cause in the areas of the protection and propagation of the Faith. Appointed to five year terms, they coordinate their activities through the instrumentality of Continental Boards. 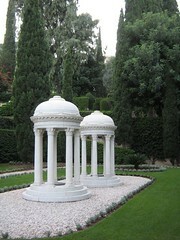 The work of the Boards–which comprise those Counsellors who reside in a specific continental region–is coordinated, in turn, by a body known as the International Teaching Centre, located at the Bahá’í World Centre in Haifa, Israel. Continental Counsellors appoint various auxiliaries and assistants, who are charged with working to stimulate and advise Bahá’í communities at the regional and local levels. There are 81 Continental Counsellors worldwide. Another nine serve as members of the International Teaching Centre. Thanks to James Warble, Marco, Bilo and Andropolis for the news and links. This entry was posted in baha'i blog, by the way... and tagged history, news by danger. Bookmark the permalink. I have had the spiritual enlightenment of speaking with Dr. ‘Ali-Muhammad Varqá many years ago. After a meeting of Bahá’ís at the Javanmardi’s home in LaSalle, QC, Canada, I walked over to him and, in the course of our conversation, I asked him a question. I have never forgotten and will always remember so clearly his answer as if it was yesterday after the past twenty or thirty years. He bent down a little, as I am much shorter than him, and said these three simple words, “I don’t know.” While his words were short and honest, it was the effect on me that was stunning! The only way I can explain it is to use the words of the Universal House of Justice, “…his manner was imbued with a luminous gentleness, a genuine kindliness and a natural dignity which combined to reflect the character of a saintly personality.” I don’t recall what the question was, but I will always remember his response.